I seldom go without a suitcoat or jacket of some sort. I just feel incomplete without one. But it’s been hot here. Really hot. Gold Bond cooling body powder hot. And today, while I swealtered in an unconstructed, unlined, linen and cotton sack coat over an open collar dress shirt, my architect friend looked fairly comfortable and still stylish…. How’d he do it, you ask? He knows his own style, and in summer he invariably wears well-cut, well-worn, pressed khakis, Belgian shoes, a dress shirt, Ray-ban aviators and… a perfectly worn crocodile belt. Or maybe it’s alligator? Whatever, they’re a great shade of golden brown — bordering on a malt whiskey. 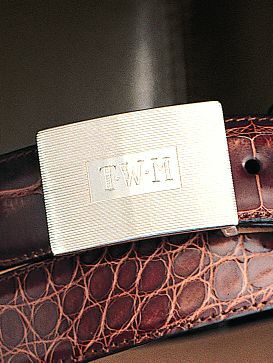 The belts have either an engraved sterling silver slide buckle (like the Trafalgar belt and buckle by dann-online.com shown above) or gold “regular” buckle. It’s a winning combination. Simply by owning them for as long as you have, they acquire patina and something of you. Call it throw-away elegance. Or an “old money” look. Non-chalance. Ralph Lauren has mined this look, repackaging English country and American Preppy and re-selling it (sometimes with frayed cuffs or the odd hole) to us lock, stock and both bespoke barrels. What my friend has mastered is the ability to look as if you’ve always had wonderful taste and live in clothes that look like they were made for you alone. Although in his case, that would be true. So, invest in quality articles, and wear them ragged. They’ll serve you well. And you’ll look even better for it. This entry was posted in Elegantology and tagged accessories, alligator, architect, belts, clothing, Elegantology. Bookmark the permalink.